Friendlier than most with strangers, they may help you make that awkward introduction to your new neighbors. Alert, self-confident, physically active dogs that require daily mental and physical activity to prevent boredom and difficulty in handling. Very affectionate dog breed that loves human attention and will make good family pets. 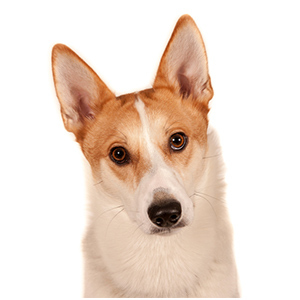 They require daily mental and physical activity and are well suited for many dog sports such as herding, agility, water work, flyball and obedience training. Also called the Norrbottenspitz this breed has been around since ancient times as a hunting dog though is presently favored as a general companion. 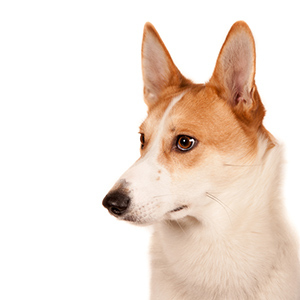 After World War II the breed nearly fell out of existence. However, starting with the 1966 creation of a breed standard by the Fédération Cynologique Internationale (FCI), and then the acceptance and a new standard by the Swedish Kennel Club in 1967, and finally, in 1973, the writing and acceptance of a breed standard by Finland, the Nordic Spitz was back on the map as a full-fledged breed. Both Finland and Sweden are making a great effort to ensure the health of this breed that carriers their region’s name, by highly controlled breeding practices. While almost light in appearance this is a powerful breed. 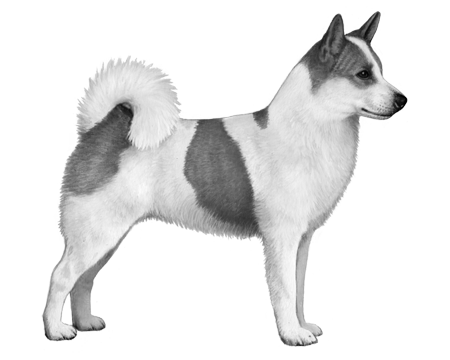 The Nordic Spitz is slightly taller than they are long and like many breeds from this region they feature a double coat for heartiness in harsh climates. Their outer coat is almost hard, very straight and dense while the undercoat is quite soft and insulating. 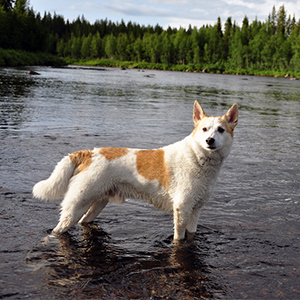 Their base color is white and they have red or reddish-brown markings, similar to the style of markings on the Karelian Bear Dog and Finnish Spitz. Alert, confident, attentive, active and daring, all words used to describe the Spitz and the Nordic Spitz is no exception. They can also be loving and loyal family pets with a real thing for their owner, enjoying following them wherever they go. They have also been noted as being friendly to strangers, so while not an ideal watch dog, they may just help you meet your new next door neighbors.